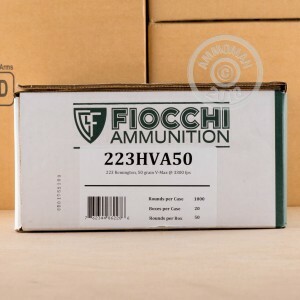 Take the fight to the varmints with your AR-15 or other .223 Remington rifle and this deadly hollow point ammunition from Fiocchi. 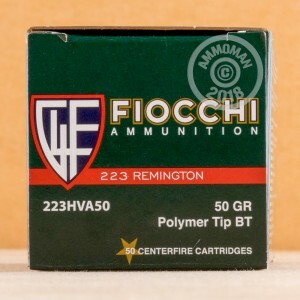 These cartridges feature a 50 grain version of Hornady's polymer-tipped V-MAX hollow point bullet, one of the deadliest varmint-specific projectiles available. A muzzle velocity of about 3,300 feet per second gives this ammo similar ballistic properties to M193 ball, with a slightly flatter trajectory. 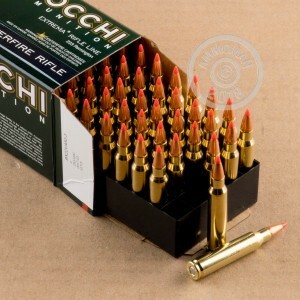 This ammo comes in convenient 50 round boxes and uses non-corrosive Boxer primers and brass cases.